Ahhhhhhhhhhhh what we will do for yarn! 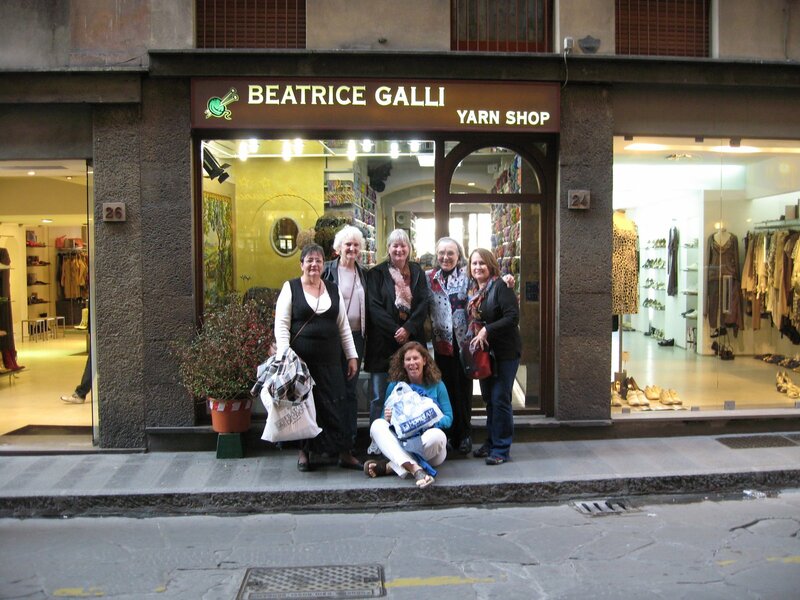 Here we are in Florence (the one in Italy) with Beatrice Galli in front of her yarn store. I googled “yarn shops in Florence Italy” and up popped Beatrice’s store. It was Monday before we left, and I emailed her for the hours for her shop, thinking I wouldn’t get an answer before I left for Phoenix on Wednesday. I had an email from her on Tuesday. We looked her up, she has a wonderful view of the Ponte de Vecchio, a notable bridge lined with goldsmith shops. Naturally, we looked her up and dropped some serious coin. If you ever go to Florence, she is easy to find, and quite sweet! ! There were several completed objects on this trip, and one new knitter who cast on and finished a scarf (her first) during this trip. It even drew a nice comment from Beatrice, which is the ultimate compliment! 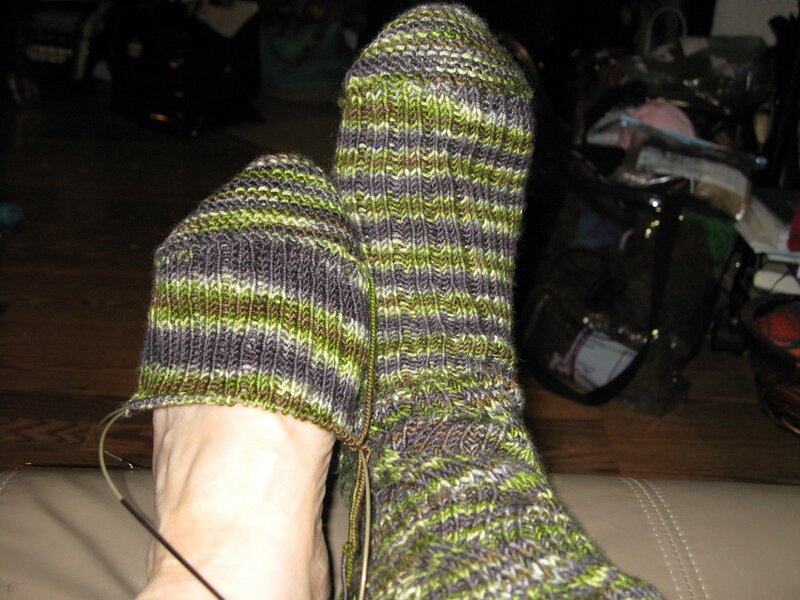 Here are my miserable Inside-Out socks in the Monsoon colorway from my Rockin’ Sock Club. I have to really get busy on them, since my 2nd kit arrived today. developed some problems with it om the trip, so I put it in time-out. I finallly finished the first and started the second yesterday. I have to get cranking on the second one so that I can dive into the new kit. I cannot knit on these socks in public for an obvious reason when you see the sock in person. Come to knitting on Sunday and I will show you why. Even so, they are very comfortable. 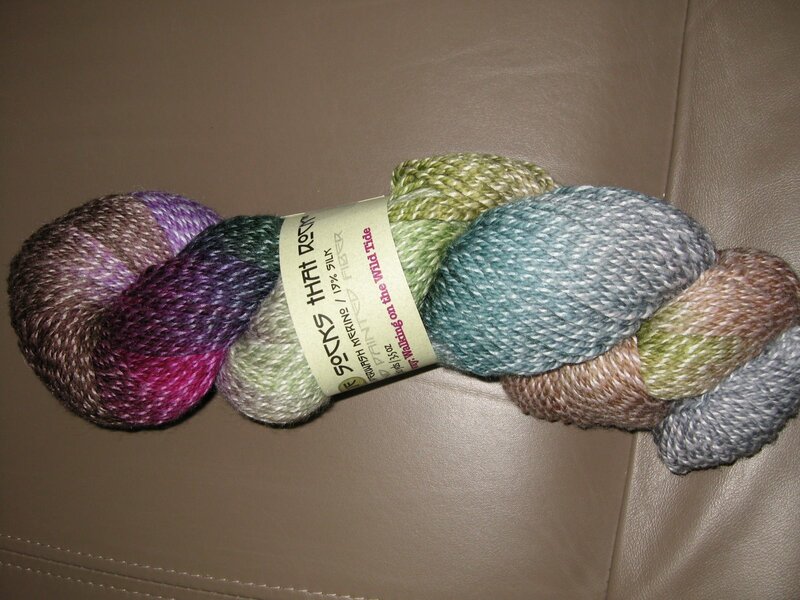 And here is the new yarn! I will bring it Sunday. It is a new blend of merino and silk from Blue Moon Fiber Arts. Their sock yarn is proving to be absolutely yummy-delicious. I can’t believe that I haven’t posted since February. Bring your knitting on Sunday, if you have any FO’s (finished objects, as opposed to unfinished objects), bring them for photo acknowledgement. See you then! The new yarn should certainly be a good incentive to get the first pair finished. That stuff is gorgeous!